This is one of the great Fender amps. Famous for Mark Knopfler’s “Sultans of Swing” recording this is a perfect amp for recording or small gig applications. More power and headroom than a Deluxe but nice and light to carry around with a single 12″ speaker. Many modern speakers will sound better than the Oxfords but a good original speaker (if you can find one) sounds great too. The tremolo circuit is lush and complex. Many of the original amps need new caps to bring the trem back to full depth. This amp can easily become your favorite for many applications…. unless you do metal…. then just get a bigger amp. I own one of these (1963, mint except for aftermarket speaker). I have a question about the speaker impedance though. Here it is listed as 8ohms. However, the guy I emailed at Fender thought it would be 4ohms. I need clarification! 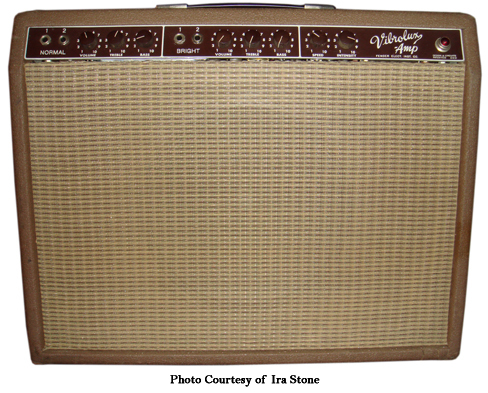 The guy from Fender was probably confusing it with the later Vibrolux Reverb that had two 4 ohm speakers. My ’61 Vibrolux has a single 12″, 8 ohm speaker. I have Jensen P12N in it now, but originally it had an Oxford. My output transformer is marked “125A7A”, and is designed for an 8 ohm output, but iI have heard of early Vibroluxes where someone installed a 4 ohm OT at a later date. there, and the Vibro just ran RINGS around the DR! The DR did clean chime better, but the Vibro had the sweetest brown tone I have ever heard. One thing did perplex us- by all accounts, the Vibro is a 30-watt amp, the DR 22 watts- but the DR was easily louder and had more head room. Both amps have a confusing history- the DR seems to have been “black faced-” the “Pull-Bright” function is disabled; the Vibro was apparently butchered by some misguided soul who wanted it to sound like a Twin (like I said, misguided) and then put back by a very well-respected amp tech in New Orleans. The only thing we could figure was the Vibro was de-tuned to be more brown, at the expense of power. We thought it was worth the trade-off. Wish I had my Ampeg Jet J12T with me, would have liked to A/B it, too. That amp has actually pissed me off- I though I was done with amp shopping. Now, I want a Vibrolux! I own a 1962 Vibrolux “Brownie” amp that was a Christmas gift to me from my dad, Christmas 1967. My first Amp. It is all original except that I removed and stored the original Oxford speaker and recently replaced it with a 2007 Jensen P12N. It also needed to be recapped to bring it back since the E-Caps were dying off, and a grounded power cable, so there’s that. The thing absolutely sings! It, is my #1 amp If I don’t use my 1964 original BF Deluxe Reverb, or 1966 BF Super Reverb, or one of my two 1960’s Tweed 5E3 Deluxe’s or my Tweed 1962 Champ or my 1968 SF Drip Edge Champ. All my amps are original and I am blessed to possess and perform with some of the greatest amps from one of the greatest amp & guitar designer/builders that ever lived; Leo Fender. I have many other makes and brands to compare with, all of which have great and differing useful sounds and tones. Forever Thank you for my Fenders, Uncle Leo!